1. Season squid with calamansi juice and ¼ tsp iodized fine salt. Fry for 3 minutes or until changed in color. Set aside. 2. Boil tahong in 2 cups water until shells are just opened, discard half shell and reserve stock. 3. 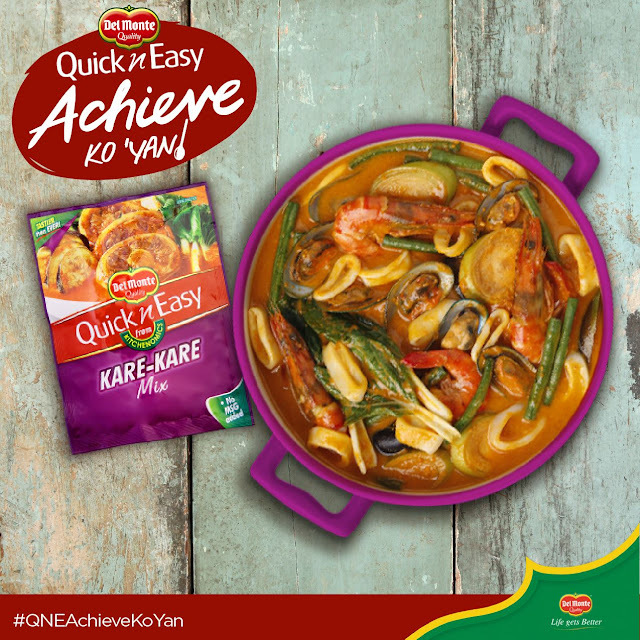 Combine DEL MONTE Quick n Easy Kare-Kare Mix mixture with sitaw , ginger and drained banana heart in pan. Cover and simmer for 5 minutes, stirring occasionally. 4. Add shrimps, taba ng talangka and tahong. Stir. Simmer for 5 minutes. 5. Add pechay and squid. Simmer, while stirring continuously for 3 minutes or until cooked.